Butkovich, Brad. The Battle of Allatoona Pass: Civil War Skirmish in Bartow County, Georgia. (The History Press: June 2014). 192 pages, illustrations, 11 maps, notes, bibliography, index. ISBN: 978-1-62619-461-8 $19.99 (Paperback). Most Civil War buffs are familiar with the bookends of John Bell Hood’s tenure as Army of Tennessee commander at Atlanta and Franklin/Nashville. Many, however, don’t realize Hood led a third campaign in October 1864 against Sherman’s supply line to Atlanta. Brad Butkovich steps in to ably fill the void with The Battle of Allatoona Pass: Civil War Skirmish in Bartow County, Georgia, a look at the key battle of Hood’s campaign against the Western and Atlantic Railroad. Brad Butkovich is an experienced wargamer, wargame publisher, and historian. He has a BA in History from Georgia Southern University. Butkovich is no stranger to the Western Theater of the Civil War, with a History Press title on Pickett’s Mill and a wargaming scenario book on Chickamauga to his credit. Brad’s web site, http://www.historicimagination.com, offers these products as well as a link to his Civil War Virtual Tours. In late September 1864, John Bell Hood had limited options. His small Army of Tennessee, greatly reduced in numbers due to the offensive operations around Atlanta in late July 1864, was simply unable to retake fortified Atlanta from Sherman’s army group. What then? Hood decided to strike Sherman’s vulnerable supply line, the Western and Atlantic Railroad, leading back from Atlanta to Chattanooga, Tennessee. No spot on that line was more vulnerable than at Allatoona Pass, where in antebellum times enough rock was blasted out of a mountainside to fit a single line track through the pass. If Hood could obstruct this pass and destroy the supplies being stored there, he could cause significant issues for Sherman, then planning his march to the sea. Hood launched his campaign in the closing days of September 1864. Though he moved with his entire three corps army, only French’s Division of Stewart’s Corps fought at Allatoona Pass. Hood thought the garrison was small, and he was right, with only a portion of the First Brigade, Third Division, Fifteenth Corps, Army of the Tennessee posted there under Lt. Col. John E. Tourtellotte. What he didn’t count on was a determined effort by a few resourceful Yankees to get trains to John D. Corse’s Division stationed in Rome, Georgia, north of Allatoona Pass. There was only enough space on the trains to fit one brigade’s worth of men (one regiment of 2/4/XV/AotT and a portion of 3/4/XV/AotT) and Fourth Division commander Corse. These men reached Allatoona Pass on October 5, 1864, the day the battle took place, and they were just barely enough. This division sized fight between French and Corse raged until the afternoon, when French decided to retreat due to inaccurate reports of approaching Union infantry reinforcements. The Confederates were a bit unlucky in this fight. A lot of things had to go right for the Union to have a division sized force at Allatoona Pass by the time they attacked. But credit Gen. Raum for ordering the reinforcements from Corse to head immediately for Allatoona Pass, and credit the men charged with getting those reinforcements to the right place in time to make a difference. Butkovich also details the unfortunate decision of Hood to send French’s Division, and only French’s Division, to attack at Allatoona Pass. In addition to being the smallest of Stewart’s three divisions, French’s was also the furthest away. The other two divisions would have reached Allatoona Pass much more quickly, and may have been able to capture the place prior to Corse’s arrival. Lastly, the author also questions how serious Sherman was about getting reinforcements to Allatoona Pass in time to save the day. Butkovich concludes based on the extant sources that, the General’s protests to the contrary notwithstanding, Sherman’s top priority wasn’t to save the garrison there. Read the book to find out more about these and other controversies. 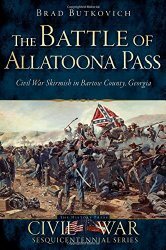 The only other work I could find on Allatoona Pass was Joseph M. Brown’s The Battle of Allatoona, October 5, 1864, written by Joseph M. Brown in 1890, so the battle was due a modern treatment. And Butkovich provides another strong work on the western Theater, just as he did for Pickett’s Mill. 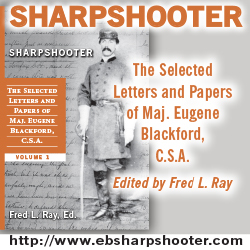 Drawing from a variety of sources, including Union and Confederate first person accounts from the pages of the National Tribune and the Southern Historical Society Papers, the Official Records, and archival sources, Butkovich makes sure the men who were there help tell the tale. The illustrations are numerous , and the author took many photos of present day Allatoona Pass to help the reader see what the battlefield looks like today. The maps go down to an incredible level of detail, often breaking down to the company level on the Union side. This is a welcome addition to a book covering a small, division sized fight, and shows Butkovich’s attention to detail. The order of battle shows unit strengths to the regimental level where known, a detail sure to please wargamers. The Battle of Allatoona Pass: Civil War Skirmish in Bartow County, Georgia is one of a large number of smaller battles History Press has shed some new light on. Just in the past few years I’ve also read and reviewed Butkovich’s earlier effort on Pickett’s Mill, Jimmy Price’s look at New Market Heights, and Doug Crenshaw’s book on Fort Harrison. The Battle of Allatoona Pass: Civil War Skirmish in Bartow County, Georgia is another excellent effort by Brad Butkovich, adding to his work on the Civil War’s Western Theater. The book covers an often overlooked battle and campaign nestled between much larger and more famous efforts. Students of the Western Theater, those interested in John Bell Hood’s Confederate career in the West, and those looking for books on lesser known fights rather than the thousandth book on Gettysburg will find this a good read. One in a long line of The History Press Sesquicentennial Series of books on the Civil War, The Battle of Allatoona Pass: Civil War Skirmish in Bartow County, Georgia is among the better efforts in that series, with excellent maps tied to the descriptive text. Check it out. You won’t be disappointed. I find upon my arrival home & after diligent search back, Brig. Genl. Young’s report of the (Ector’s Texas) Brigade of its “action taken” from the time of your taking command of the Army of Tenn, say from July 19th to Sept. 17th 1864. The report of the then Brigade Comndr Col. CD Coleman of N.O. giving full & detailed report of its operations from the time we left Lovejoy Station Ga to our arrival at Tuscumbia Ala is lost or mislaid. In the report Col Coleman gave a very full & vivid picture of the eventful campaign & dwelt largely on our “action taken” from the time we struck the Chattanooga & Atlanta RR at Big Chanty & of all the different fights & skirmishes we had at various points on the RR and it also gave full account of our Altoona Heights fight which was quite severe & in said report he gave particular attention & called the whole country to understand that had it been left to our men & those of Brig Genl FM Cockrell of Missouri then commandg a brigade in our division Sherman would have been compelled to abandon his march to the Coast as we were several hours in possession of the greater—yea the whole of his Army stores. I for one say that they could have been destroyed & only reason why they were not was by Maj Genl SG French ordering otherwise. I am one who has always been a Hood man so far as the move in rear of Sherman’s army & attribute lack of greatest success to the disobedience & jealousy of many of your subalterns. If I can in any way be of service in any manner whatsoever command me—not for any personal or pecuniary motive but merely as a brother soldier & one who admires a good & brave man. I send accompanying this Col Wm. H Young’s report & if it can be of any use to you use it & when done return it to me at Campti, Natchitoches Parish. Thanks Sam. I’m looking or to the Hood Letters book. Do you have a specific date yet this year, or is that still up in the air? 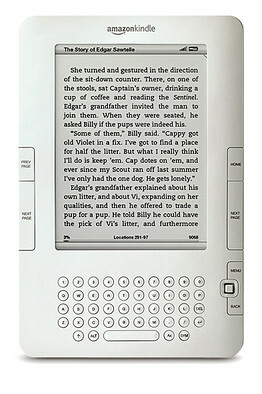 Sounds like it has all the good elements that the Pickett’s Mill book possessed. Scaife published a book on the Allatoona battle, of course (like all or most of his books) the main point of interest to guys like us being his great maps. for asking and I’ll keep you apprised. That seems like a strange title to me. Was it a battle or a skirmish? I think there is a difference. I’d say it was a battle. The title of the book was ultimately decided by the publisher. My initial title was The Battle of Allatoona Pass: With Supreme Fidelity. “with supreme fidelity” was a quote from then lieutenant William Ludlow. They felt my title didn’t adequately describe the fight to those not very familiar with the Civil War. Please don’t take this as a knock against The History Press. They are great to work with. Brad: I agree with you that it was a battle, and I much prefer your original choice of title. As a student of the 1st Missouri Brigade, I know that the soldiers considered it a battle. Thanks for the reply.